Neither El Niño nor La Niña is expected to impact the monsoon this year, the met department said on Monday. While such ‘neutral’ years are generally associated with normal rainfall, a look at the past 21-year record shows a wide variation in monsoon’s performance. From 1997 to 2017, there were 10 neutral years during which the monsoon varied between 88% of average (drought) to 106% (above normal). On the whole, the mean monsoon performance during these neutral years was 97.5% of the long period average (LPA), which is in the lower end of the normal range (96%-104%) — indicating that monsoons have been generally depressed in the current era. The mean monsoon output in the neutral years, however, is way above that of El Niño years (86%) and below the mean for La Niña years (99%). 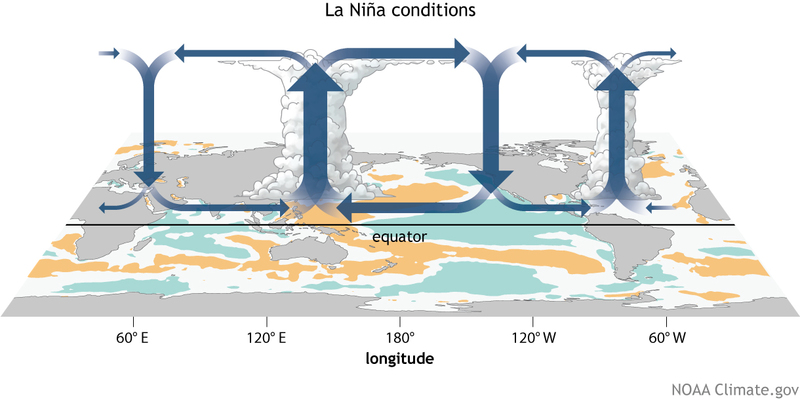 These differences highlight the strong connection of the Indian monsoon with El Nino and La Niña, which are opposite conditions in the Pacific Ocean. El Niño is an abnormal warming of surface waters in the east and central equatorial Pacific which negatively impacts the monsoon. La Niña is the opposite — an abnormal cooling of waters that aids the monsoon. As the 21-year data shows, there are years when this relationship doesn’t hold. However, the monsoon’s performance varies significantly during the neutral years as well. These variations are a result of many other local and large-scale factors. Among the large scale factors is the Indian Ocean Dipole (IOD), which is expected to be weakly negative during the second half of this year’s monsoon. A positive Indian Ocean Dipole phase is seen to generally aid the monsoon while a negative phase could depress rains. Another highly unpredictable condition with sharp, although short, impacts on rainfall is the Madden Julian Oscillation (MJO), a periodic eastward moving weather disturbance close to the equator. MJOs can depress or enhance rainfall for a week or two, depending on their position and strength. Slow-moving or stationary MJOs can have longer impacts. A well-positioned MJO can invigorate the monsoon while its absence tends to prolong breaks in monsoon rains. MJOs, however, are very hard to predict. Finally, the distribution and intensity of monsoon rains comes down to the number of low-pressure systems and depressions coming inland from the Bay of Bengal. During active monsoon periods, the frequency of these systems are usually high. On some occasions, even winds from the northwest (western disturbances) affect rainfall. The interplay of all these factors make monsoon forecasting a highly hazardous profession.